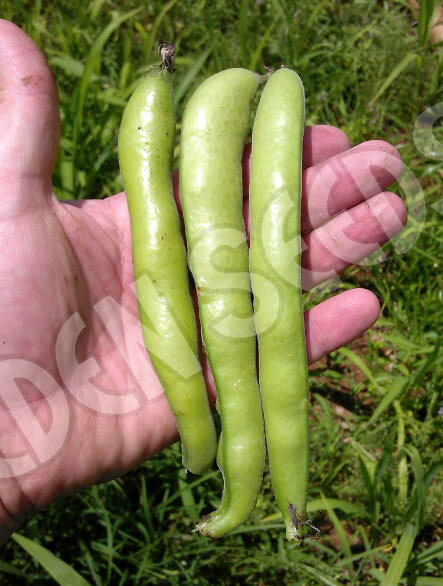 Heavy crop with long pods to 20cm, shorter plant. Read more on growing Bean, Broad here. Known in Britain 600 B.C. 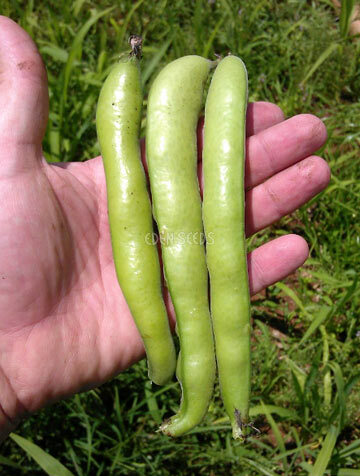 Valuable winter and spring vegetable as it withstands heavy frost, used as fresh or dried bean. Eat fresh from pods like peas, or dried seeds excellent cooked for casserole recipes and boiled as Greek style salad with avocado and garlic, also used to make hummus. Rich in vitamins B and E. Pinching out tips after the first flowers appear encourages pods to set particularly in warmer areas. Plants may need support by strings between stakes. Likes only slightly acid soil, too much manure promotes too much leaf growth. Sow late summer, autumn, winter, and spring in colder areas. Mature plants tolerate frost. 90-120 days.